It was cold outside – many minus degrees cold – but I could not go back into the restaurant; there really was not enough space inside. Just standing at the bar, awaiting Aaron and DB’s arrival, I had already been jostled this way and that, tapped here by waiters trying to hang coats on the world’s most-stuffed coat rack and slapped there by the front door flying open with incoming diners. I had only been in there five minutes. I almost do not want to mention the suspicious stares I was getting from the mademoiselle working within. ‘Cet homme a-t-il vraiment une réservation?’ her eyes said. It took the two almost half an hour to waddle their way up rue Malar and greet me outside Chez l’Ami Jean. Aaron, having eaten here last year, had been raving about how good it was. That, plus the icy temperature, plus the fact that I had abstained from eating all day meant I was especially hungry to get in and dig in. 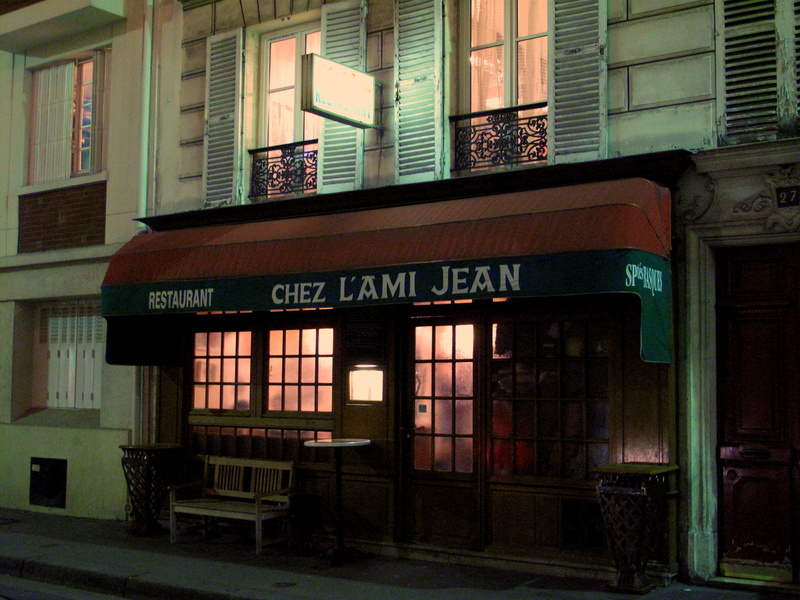 Chez l’Ami Jean, first opened by a Basque nationalist in 1931, is Paris’ most celebrated exponent of that region’s cuisine. It is also one of the city’s best representatives of the ‘Bistro Moderne’ movement. This is the name bestowed by Gault Millau on the 1990s trend that saw traditional bistros reinvented by chefs who had been formally trained in France’s more formal kitchens. In short summary, after the 1980s and what was the apogee of haute cuisine, kitchens were full of enthusiastic young chefs dreaming of opening their own restaurants. The economic recession of the early 1990s, however, meant that for many this remained but a dream, whilst for others it meant a compromise and instead of their own fine-dining restaurants, they settled on (cheaper) bistros. They brought with them new, more advanced techniques and ideas and succeeded in reversing the decline of these old establishments. The founding fathers of this movement included Christian Constant, Eric Frechon and Yves Camdeborde. In Paris, these men are household names and it was with the last, at La Régalade, where Chez l’Ami Jean’s chef, Stephane Jégo, spent twelve years as his second. Jégo, himself Basque, was introduced to cooking by his grandmother when just a child but, only after being expelled from school at fourteen, did he decide to dedicate himself seriously to the profession, taking cooking lessons and gaining a cookery diploma (CAP). After this, he and his wife moved to the French capital where, following a twelve-month stint in the army, he landed his first job with Hediard in the Place de la Madeleine. Soon however, his CV found its way into Camdeborde’s hands via Constant (then head chef at the Crillon). Jégo went to work for Camdeborde and it was under him that in 1984 he won the ‘Best Young Hope’ competition. In 2003, he chose to venture out on his own and took over this little restaurant in Paris’ 7th. He brought with him a refreshing philosophy: ‘while other chefs say that they’re going to revolutionise gastronomy, [bistro chefs] do one thing: we respect people. We don’t invert it and say that people should thank us because they were lucky to come to our restaurant. Those guys who catalogue people like they catalogue their food – it’s really stupid.’ Jégo still has his former mentor’s blessing too; ‘he is different,’ Camdeborde has said, ‘he rejoices in what he’s doing and you can feel it in the food.’ Jégo has quickly made a name for himself. Immediately upon entering Chez l’Ami Jean, you enter another, older world. A small bar sits on one’s right; to the left there is a large tray of charcuterie. Along either side and through the restaurant’s middle are rows of wooden tables and chairs where diners sit elbow-to-elbow. The lightly-coloured walls are covered in Basque rugby, football and pelota (a court sport played with a ball, one’s hand, a racket and wooden bat) memorabilia; articles and posters from the region; dried Espelette peppers; and strings of garlic. From the ceiling hang acorn-fed Bayonne hams as well as more peppers. 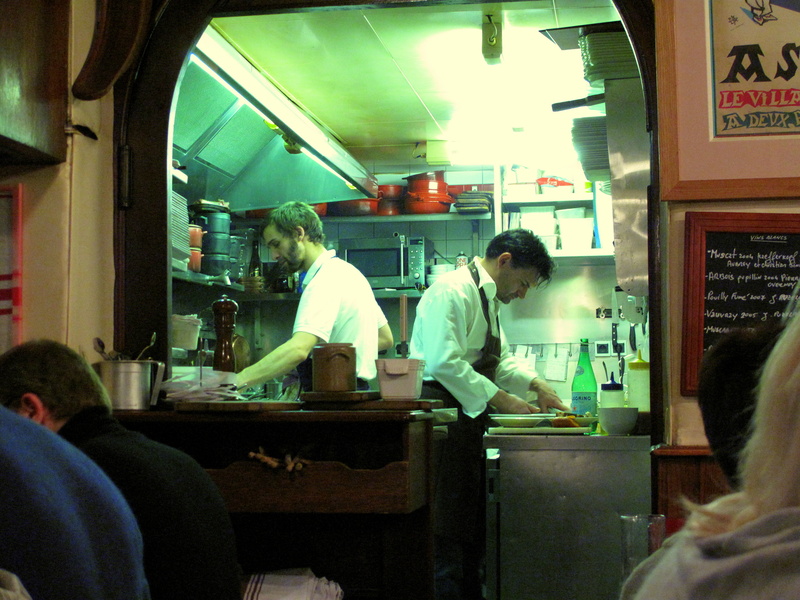 In the far left corner is the open kitchen; here, Jégo and three or four chefs with just four burners, a grill, salamander and stove, work intimately close to their customers. 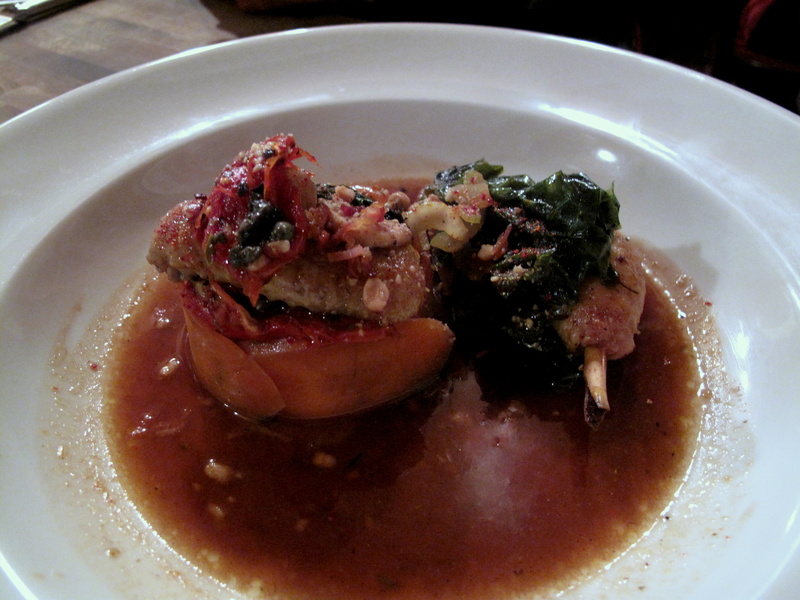 There is a definite ambience within this ‘tavern’; it is rustic and cosy and utterly charming. We were led to a table right in the restaurant’s heart from where we had a great view of Jégo and his team. We then received our menus and were informed of the day’s specials. The menu changes very regularly and is considerable in choice: there is the prix fixe with about five options for starters, mains and desserts; the ALC that boasts the bigger, pour 2 pers, plates; and the daily dishes, hand-scribbled in chalk on little writing slates. We decided to try some of each menu and ordered accordingly. Le Pain: Pain de campagne. 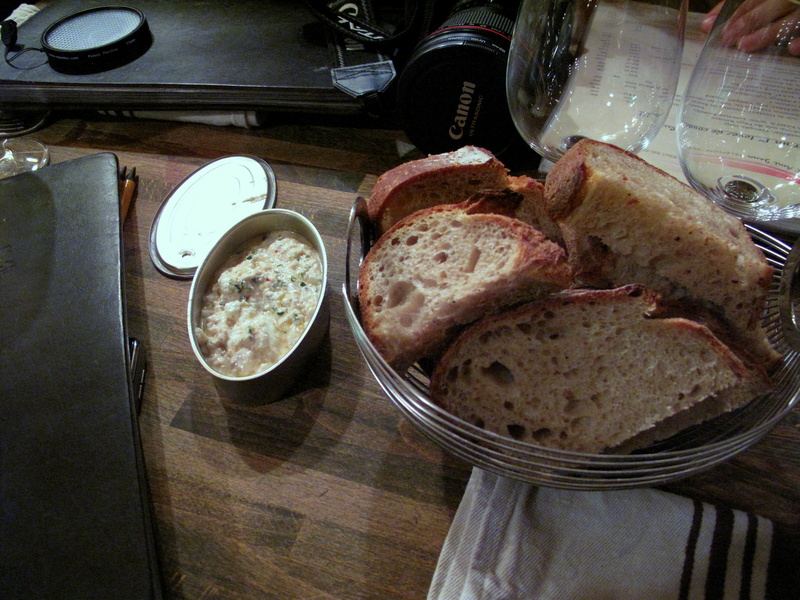 Shortly after squeezing into our seats, we were served with a wire-wrought basket bulging with country bread and a sealed tin, the sort anchovies are sold in, just a little bigger. The bread is bought in, but at least it is bought from one of Paris’ best boulangers, Poujauran, who also supplies several of the city’s three-star restaurants. Rustic in taste and cut, it comes in large, irregular chunks; it is also crusty yet soft and fluffy. Slipping off the seal of the little tin reveals fromage blanc made from ewe’s milk and perked with piment d’Espelette and chives; like a spiced and herby fresh curd cheese. It was a little watery and, though very slightly sour, really rather bland. Entrée 1: Pressé fin de sasison gibiers plumes et poils. The first of the starters, a thin terrine of seasonal game and toasted bread, was presented on a large tray together with a beetroot leaf salad and large pot of cornichons and pickled onions. The terrine itself, whose ingredients changed whomever and whenever we asked, may have been made with some mixture or all three of boar, Roe deer and hare. Whatever it was, it tasted quite good – gamey, but not overpowering, meaty, rich and perked with the red pepper and olive tapenade that was strewn over it. 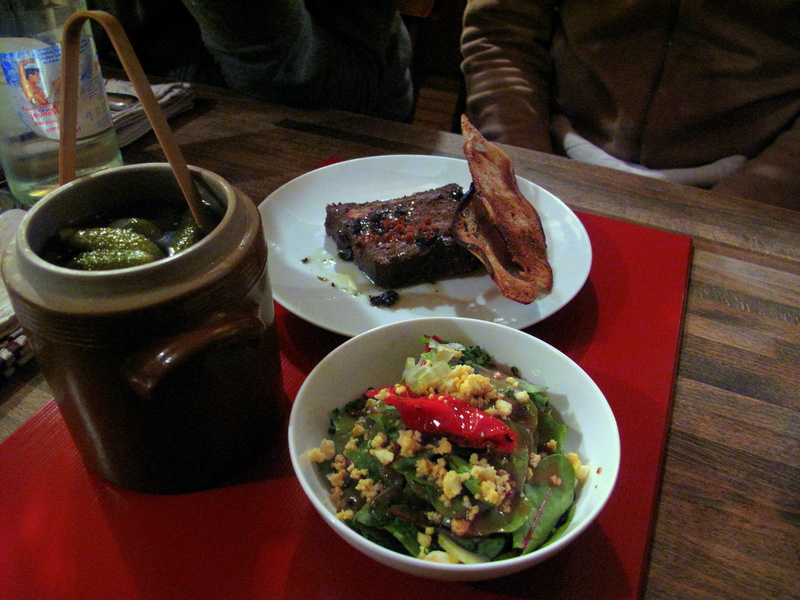 The sizeable, fresh salad had couscous and sundried capsicum, whilst the pickles were tasty and sour. Entrée 3: Boeuf carotte ‘mère-grand’, en tradition gourmande. Grandmother it seems cooked her boeuf for about seven hours, until it became shredded beef confit. Jégo has given the recipe a reworking though with the meat as a base for carrot purée, tomato, greens then carrot foam. This was DB’s dish and DB does not share food, so all I can tell you is that it was apparently nice (and that he ate it all). 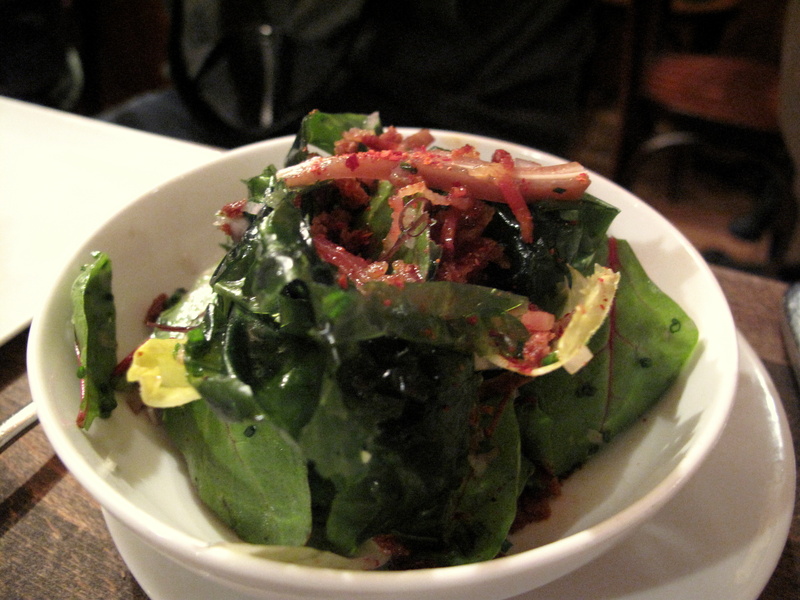 Plat Principal 1: Coquelet de choix rôti en Fine salade de mer et Bouillon. 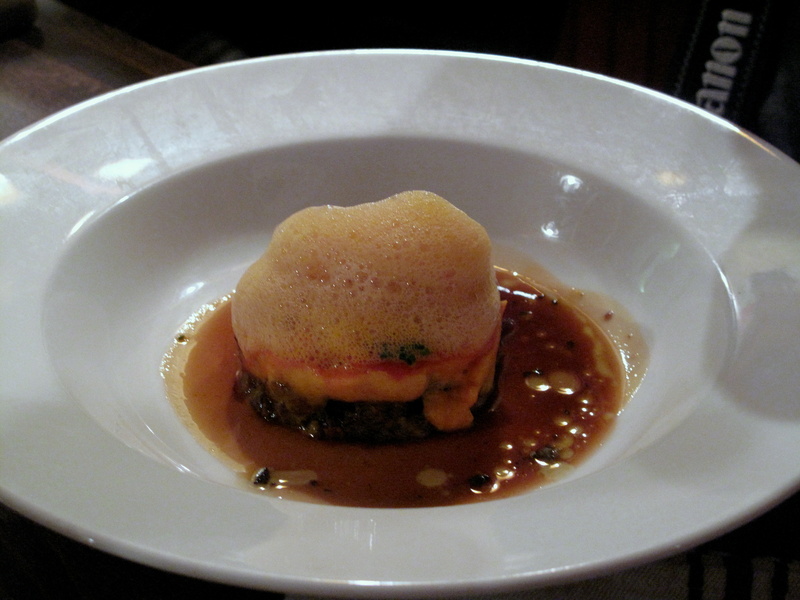 DB’s main was a roasted ‘choice’ poussin – the breast and wing wrapped with carrot and topped with sundried tomato, button mushroom and seaweed; the leg swathed with seaweed and onions – swimming in a seaweed bouillon. Again, a taste was not had, except for some of the flavourful greens (DB does not eat seaweed), but I have secondary evidence that the poussin was moist and tender; in fact, the leg was actually a little underdone for DB’s liking though the staff quickly remedied this without fuss. The combination of chicken and seaweed was quite unusual, but definitely interesting. Plat Principal 2: Poitrine de porc et oreilles rôtiers au poêlon, salade de laite de mer. Not eating pig, I was prohibited from trying both the pork belly and the pig ear-seaweed salad. However, my source has informed me that it was ‘beautifully, beautifully done’. 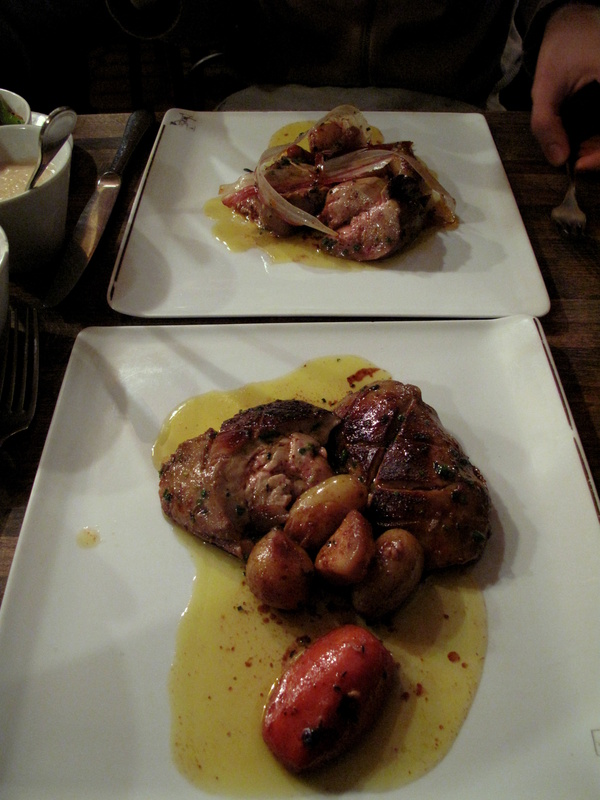 The poitrine was braised, then roasted, after which it had been enfolded in extra skin and finished on a griddle. As good as it was, the arrival of the next course meant this was left unfinished, but never one for wasting succulent pork belly, Aaron had this boxed and it was taken home, where it made for a satisfying brunch the next day. Plat Principal 3: Foie gras de canard gras rôti entire, pour 2 pers, braisé. Forget the details. I did not find out what sort of duck this was, where the bird came from, how long it had been in the oven. I was distracted. My mouth had filled with saliva. The blood had drained from my head and made its way to my stomach. I could feel my body preparing itself for some serious eating. Presenting it on a wooden board, the staff toyed with our emotions, first withdrawing the whole-roasted foie, then reappearing again a few minutes later having sliced it into its Le Creuset cooking pot with potatoes, carrots, garlic cloves and more of that ubiquitous Bayonne ham (no complaints from my fellow diners). Upon each of our squid-ink squiggled plates (did I mention it was for two to share?…sigh), the foie and vegetables were ladled tableside. This serving was certainly sufficient, but there still remained enough for same-sized seconds in the pot (no complaints from anyone this time). 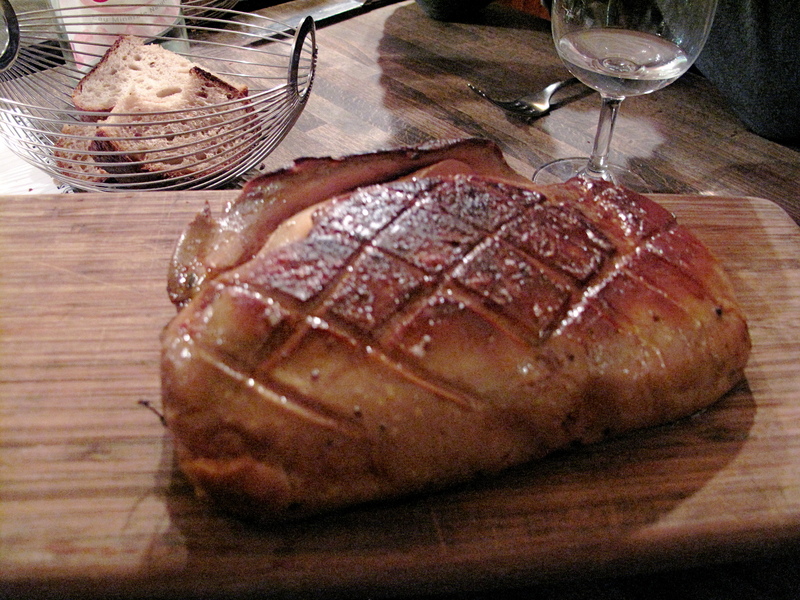 The foie gras was excellent: the flesh starting to firm, the middle still pink and melting and the taste, simply divine. The carrots and potatoes had absorbed the oil flavour from the meat and were tender themselves; I especially liked the sweet, roasted garlic. I must also make note that the foie had been deveined, but no scarring was visible which, given its mass, was impressive. Now, as readers already know, neither Aaron nor I are exactly lightweights at the dinner table, but a wave of post-foie gras guilt had washed over us and we were considering ordering only one dessert to share. Dessert 1: Riz au lait ‘grand-mère’ en service, confiture de lait. 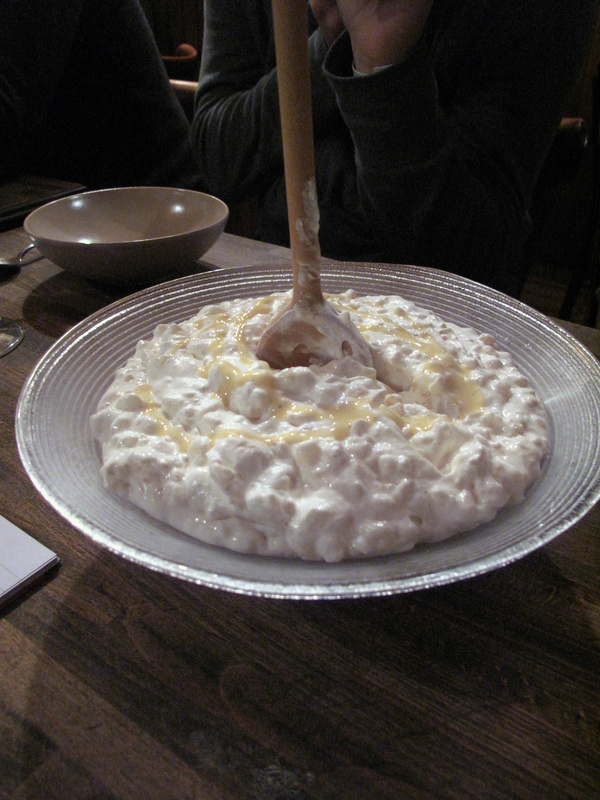 A big, big bowl of pearly white rice pudding (also like grandmother made) with swirls of confiture de lait, was placed in the centre of the table; our individual plates had pralines, dried apricot and more of the confiture in them already, ready to receive the riz au lait we would serve ourselves. This was the dessert we had originally planned on ordering as Aaron had it on his first visit here and had been waiting a year to have it again. I think he found it worth the wait. The riz was velvety and smooth; strong enough to hold a wooden spoon upright, but not sticky. The bomba rice – a Valencian, premium-quality short grain, quite starchy and considered the best sort for paella – was an inspired choice. The fat grains were firm and distinct, but had just started to melt around the edges, exaggerating the riz au lait’s creaminess. The confiture, which is a sauce of milk and sugar from Normandy and resembles dulce de leche, added richness and sweetness whilst being densely perfumed with Bourbon vanilla. This was easily the best rice pudding I have ever eaten. More importantly, another memory was made. Dessert 2: Desserts en miniature. The riz au lait was more than enough to satisfy and gratify us, but then a dessert tasting ensued and, of course, we had to continue accommodating our hosts. Two glasses arrived. One was fruity, the other chocolate. The former was composed of juicy grapefruit sitting in tart citrus cocktail with pistachio and sugar tuile. The warm latter was dark, bitter chocolate with vanilla and another biscuit tuile. These finished off, we were dealt another round – turnip sponge sprinkled with pistachio and confiture de lait in cider jelly. The moist, soft sponge’s natural turnip sweetness was amplified by the confiture whilst the cider offered a refreshing crispness. All three were decent, but the riz au lait was what had captivated us and we made sure to finish that off before we got up (not without a little difficulty) and stumbled out (not without a lot of difficulty). The meal was certainly a crescendo of eating pleasure: the starters were decent, but no revelation; the mains really delivered; and the desserts were a great finish. 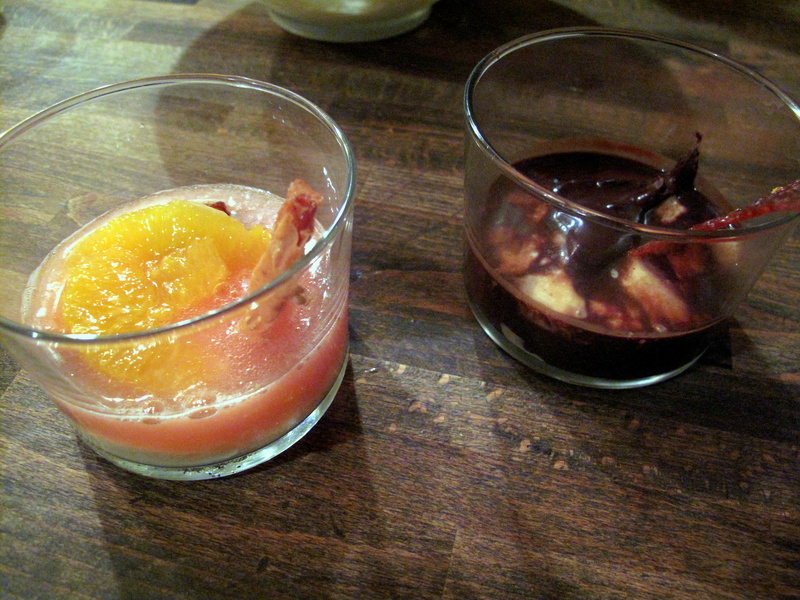 The foie gras and riz au lait, for both their theatre and their tastiness, were easily the two standout dishes for me. The food in general was presented and cooked well using good ingredients. 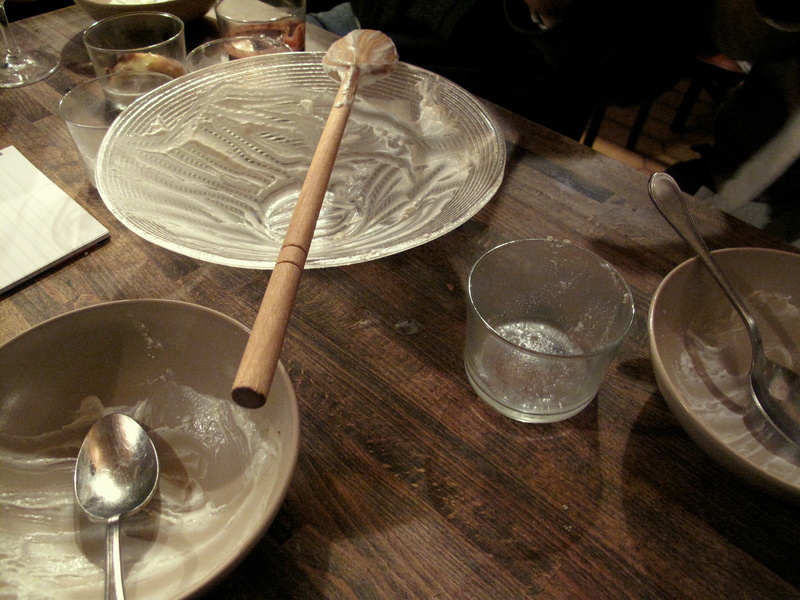 Some dishes were simple, whilst some showed the advanced technique that is bistronomy’s hallmark. 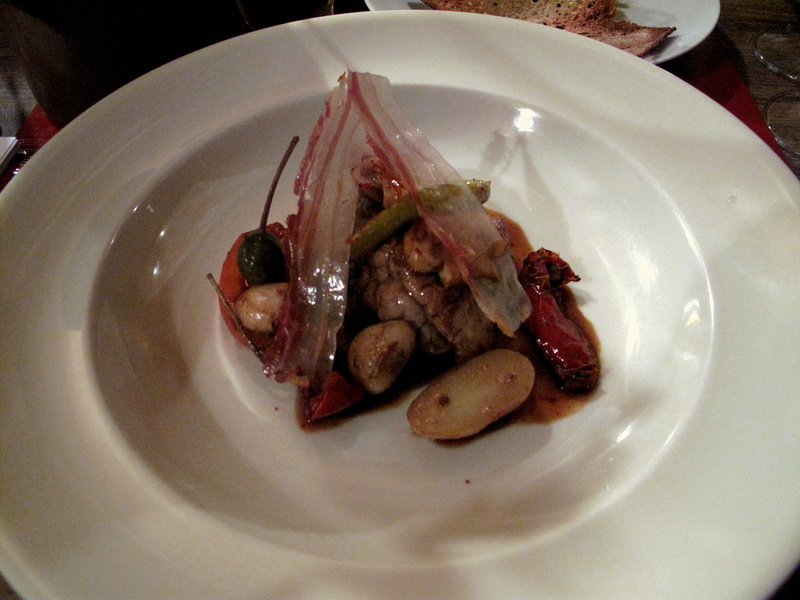 The terrine was good; the pork belly impressed; the foie was terrific; and the riz was, well, pretty perfect. Some of the produce selection and application showed creativity too – the use of seaweed was something I did not expect to see and its teaming with chicken and pig’s ears were ones I have not come across before. 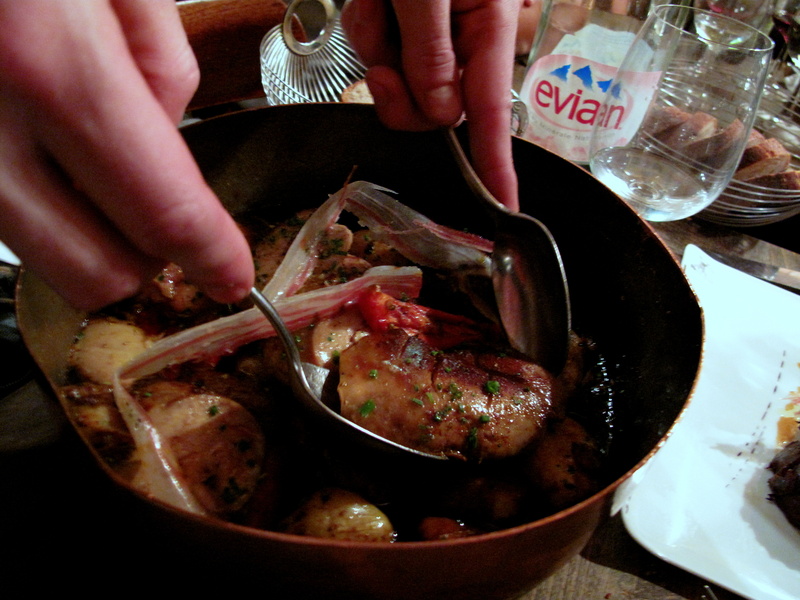 There were also dishes more customary to a Parisian bistro – slow-cooked meats, offal and terrine included. The Basque influence, however, came through but faintly (maybe influenced by our ordering) and really only in the cervelle; that said, this regional cuisine is noted for its heartiness and we certainly left stuffed. Maybe we could have chosen better from the carte too. Chez l’Ami Jean is noted for its charcuterie (which I could not eat) and there were some dishes on the specials menu, which I seem not to have noticed on the night, but look rather appealing on a second reading. These are not criticisms though and there will be chances to try more of the cooking in the future as I certainly plan to return. 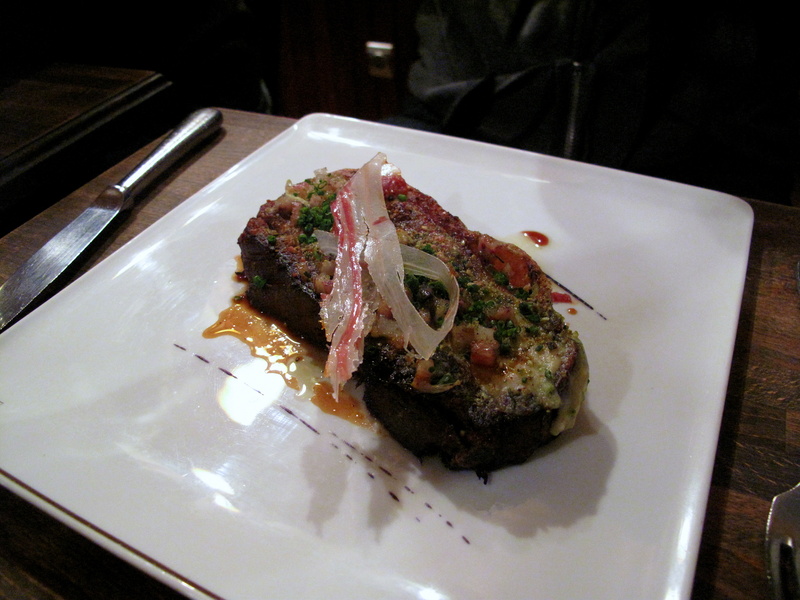 I enjoyed Chez l’Ami Jean tremendously – the food, the atmosphere, the buzz – it was just a lot of fun. I liked the tightly-packed tables; the bustling, at times loud, atmosphere; even the nationalistic décor that crowds the walls. The staff were very nice too. At first, admittedly, we thought them a little pushy and eager to take our order, but over the course of the evening, any animosity, or maybe it was diner-waiter anonymity, melted away and we left thinking how genuinely nice they were – no doubt, plying us with sweet things helped them acquire our affections, but pudding is the universal symbol of friendship. Great write-up. 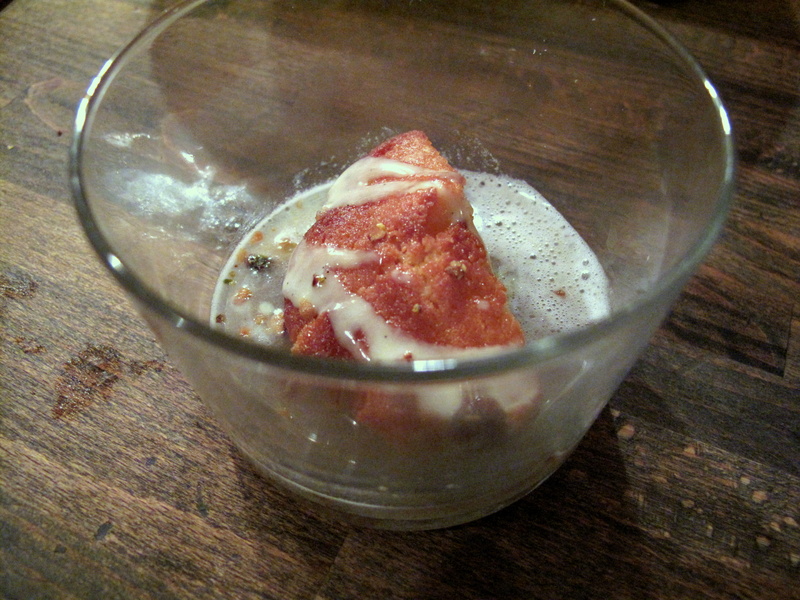 Let’s be honest, though — that foie gras allowed same-sized seconds AND THIRDS, and then some. That is still such a memorable dish for me. Well, Foodsnob, that looks wonderful but like lightsyears of running afterwards for me. This foie would have killed me – the plate lokks quite fatty in my opinion… The question is that I have no encountered a reasonable example of roasted foie after the bird flu – how was the quality in comparison? What can I say…it was so wrong, it was right! To be honest, it tasted very good. We had no complaints with respect to quality. I think Aaron could confirm. Man, this foie must be heaven on earth, with the Poujauran bread, ahhhhhh!!!! I think it is not, then Poujauran is the only excuse. It is so good. Holy moly, that looks excellent. Right, that’s top of my list when I’m in Paris in May. I know I was just there…but I am jealous (and I guess that means I am greedy too). Entertaining read apart from being one for the to do list. Very nice. We’ve walked past l’Ami Jean several times and wondered how it was. Have you tried l’Affriole, a few doors down? It is one of our favorites in Paris. Welcome Neil, thanks for your reply here. I have not tried l’Affriole, but I know of it. Next time I will stop by and take a look inside! Dining there next week and cannot wait! My mouth was watering just reading your review! Enjoyable reading, thankyou. Dearest Natasha, thank you for the kind words. As you read, it was a memorable night. Very much hope you enjoy you to…and do let us know how it goes!! Does anyone know the address of L’Ami Jean? I am leaving today for Paris and if we have a chance, we’d like to try this one. I had dinner there a few weeks ago and was really a wondeful surprise. langoustines were superbe, the sea bass as well. and also the vegetables soup was special! The review sounds quite inviting. What is the price range? After having read this,I must go there this week. Espeacialy because La regalade was one of my favourites in Paris until now. Sadly we go on saturday and than you have to decide between the early or the late table. Do you think two hours is enough? By the way great writing, excellent guide for those who search. @Martin It’s not too bad for Paris. You can eat very well for under E100/person. The price we paid that night escapes me at the moment, but I feel it was around E70. @Andreas. I should think two hours will work. The wait is not long between courses. Coming back from Paris, I found a new favourite bistrot. The Chez L’Ami Jean is as good as you described it. Although we just had a rather bourgois menu. we got a sense of what would have awaited us eating a la carte. The atmosphere is nice and the stuff was exactly as you described it. Bute when we left the restaurant we had this great taste in our mouth. We will definitely come back. Good to hear. Very happy you liked it! Just came across your review. We were in Paris for two weeks in November, 2009. 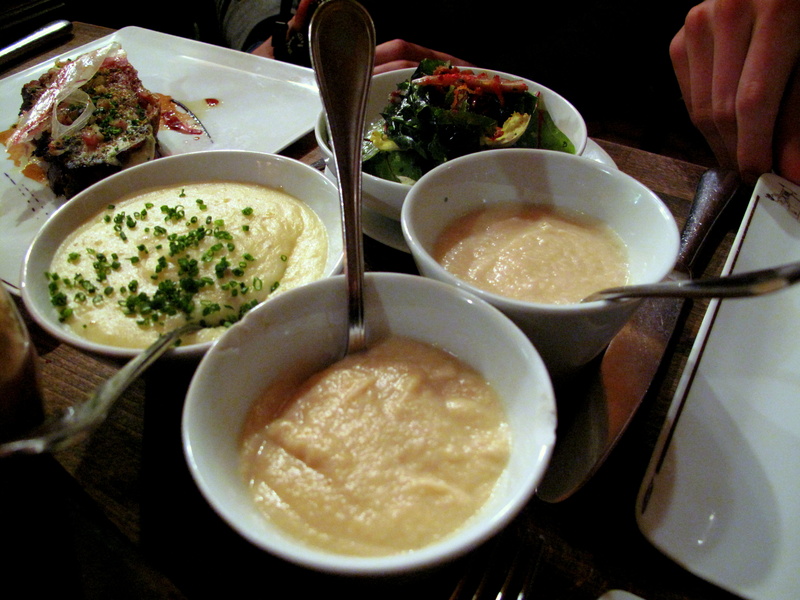 We ate at L’Ami Jean three times and I would go back to Paris just to eat there again. The staff were wonderful and Stefane was really nice to my husband and I.
We’ve been going to l’Ami Jean since 2002, when we lived in Paris, and have made a point of eating there for the last couple of years while on short trips to the city. Sadly, our meal in January 2010 was a let-down. Whereas we’d previously enjoyed the informality of the service, this time the atmosphere felt like a theme park (with the waiters loudly barking out English explanations to visiting tourists, who seemed to make up nearly all the clientele). Ordering there is never easy: there are all the options of the prix fixe, plus other dishes in the bound menu, along with the daily specials on blackboards. But our waiter expected us to decide within about a minute, and kept returning grumpily to our table. We ordered a lievre à la royale from the blackboard, which we were told would be much too small for two people to share. Our waiter asked if we wanted truffle grated on top for a supplement, which seemed ridiculous when you consider what lievre à la royale is. The divided hare portion arrived in two tiny heaped portions (no bigger than a small clementine) with a little piece of cooked foie gras on top. Certainly this was small! In fact, they had neglected to bring us the rest of the dish, comprised of a covered pan with more hare in it and a bowl of mashed potato. This arrived minutes later, at which point the waiter seemed surprised we’d already started. The hare was delicious and could definitely have served two people — the hefty terrine we had deliberately ordered to start, because of the waiter’s warning about the hare, was unnecessary. What with the attempt to get us to order truffle, the filtered water that they now insist on you having and charge you for, the deceptive information about portion sizes — we had the impression that l’Ami Jean has become quite rapacious. Despite the hare being very good, the service was off-putting. 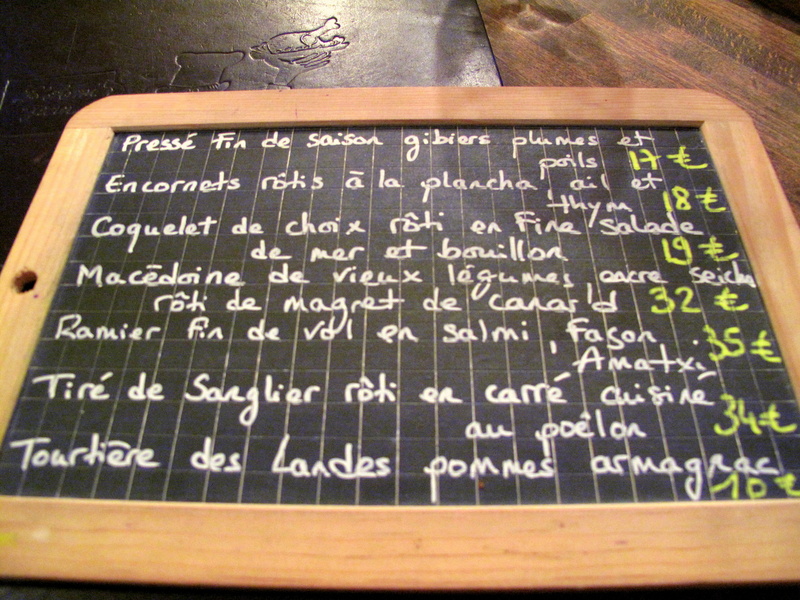 Possibly, ordering from the prix fixe is still satisfying but a meal two days later at Josephine chez Dumonet was a much more pleasant experience. @Barbara Three times! I bet they liked you! @Ben Sorry to hear that your experience, on the other hand, was pretty depressing. Almost anything that could have gone wrong, did by the sounds of it. price level of the visited restaurant. – some of us do travel on a budget. As for prices, apologies for the inconvenience, but I do not include these in my posts. We just came back from Paris and had a wonderful dinner here. You are absolutely correct regarding every statement above- the atmosphere, the bustling, THE RICE PUDDING!! It really was a very memorable dinner!